On 22nd October 1961 the deputy Chief of the US Mission to Berlin Allan Lightner and his wife were heading for a theatre in East Berlin. While crossing the border at Checkpoint Charlie his car was stopped by East German border guards. This act violated the four power agreement which prohibited any German authority to stop allied personnel or even check their passports. Lightner refused to hand over his passport as he was instructed. Instead he asked for a soviet officer to check the papers. After no soviet showed up Lightner informed General Lucius D. Clay of the situation. After the construction of the wall in August Clay was sent to Berlin as Kennedy's personal advisor. Clay did not hesitate but sent eight Military Policemen who were equipped with M-14 rifles and fixed bayonets. They escorted the car to the theatre on Leipziger Straße and back to the west. 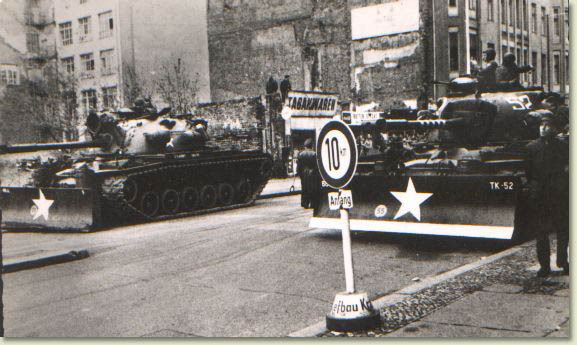 To underminde the american position four tanks were sent to Checkpoint Charlie. The soviets did not react to this action. However the following day the East German government announced through the radio that allied personel not wearing uniform would be checked by East German authorities. This was just another step towards reducing the rights of the Western Allies. General Lucius D. Clay decided to prove the determination of the United States by not giving in towards the Communists. The following days more probing rides were executed. The East Germans again tried to stop the american cars. This lead Clay to take more serious steps. Ten tanks equipped with dozerblades were sent to the borderline at Checkpoint Charlie. Obviously the dozerblades could be used to tear down the wall. This was even exercised earlier. Now the Soviets reacted. In the night of October the 25th 33 soviet tanks were sent to Berlin. This was about the same number as the americans had stationed in Berlin. Ten of these tanks were sent to the eastern side of Checkpoint Charlie the following day. The equal number of tanks standing face to face loaded with life ammunition showed that the soviet side was not interested in any further escalation. For sixteen long hours the tanks accompanied by infantry and hundrets of bystanders faced each other. After sixteen hours the soviet tanks withdrew from the scene followed by the withdrawal of the american tanks. President Kennedy and the soviet leader came to an agreement leading to the withdrawal of the tanks. After this incident the soviets would not allow the East German government to take actions against the rights of the western allies. Another consequence of this incident was the East Germans equipping the border with anti-tank barriers.